A wild week one had every match decided by five points or less. The new boys went 1-1 on the weekend. The championship rematch lived up to expectations. Some questionable decisions by teams at times, but the level of play has certainly been raised a notch. The NOLA Gold were able to score about one minute into the match against the Toronto Arrows and they never looked back. Six Gold players were able to dot down tries as NOLA gave the Arrows a rough welcome to MLR. Cam Dolan was a big pick up for the Gold and he showed why. He was all over the field and had multiple try assists on the day. Tristan Blewett was able to preserve the day for the Gold. After a charge-down from Billy Stewart, Blewett was able to jump on the ball for the winning score. Toronto had a rough start as they gave up a bonus point try in the first half. John Moonlight was able to get the Arrows only score of the first half on the board with a spin move near the try line. The Arrows flipped a switch at halftime as they came roaring back with two tries from Dan Moor within 10 minutes of each other. The Arrows looked to have the momentum after a penalty try, but it was taken away from them with the charge-down try from NOLA. NOLA showed some big improvement from last season. They struggled to gain any momentum last season and finally had some this game and came away with the victory as a result. Toronto got punched in the mouth and couldn't recover. Now they know what they are dealing with and can adjust accordingly. NOLA now prepare to host the Glendale Raptors. Meanwhile, Toronto gets an early bye week before heading to Austin. The SaberCats lone victory last season came against the Austin Elite and so far they've matched their win total from last season. Sam Windsor was Houston's sole point scorer on the day, with all 21 points coming from the boot of the Australian. Houston wasn't going to take any chances in this game because of the weather, so they took their points when they could get them. The Austin Elite looked to avenge their loss to Houston from last season, but came up short thanks to a gift of a penalty. The Elite played some good ball, but couldn't take advantage of their chances when they were given to them. Josh Larsen was able to give Austin the lead late. But the Elite gave up a cheap penalty from a makeable position at the end of the game. Houston looked somewhat better than we have seen from the preseason. And Austin took their lumps as well. The scrum matchup was close to even, but the SaberCats were just a little bit better on the day. Houston gets a week off before heading to Southern California to take on the Legion. Austin gets a short week to prepare for the Utah Warriors. Rugby United New York was always going to challenge for a top position in MLR this season. They have a ton of talent, both domestic and intertional, and have the coaching to back it up. New York got the scoring started in this match with a try from Chris Mattina. Ill discipline followed in the second half for RUNY and they were ultimately bailed out by a penalty try. The talent is there, now RUNY just needs to put it all together. 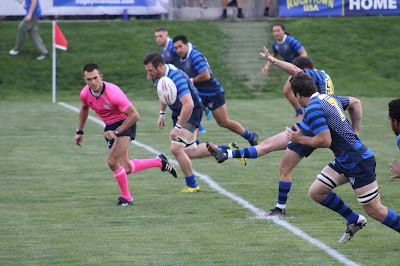 San Diego showed that they will be one of the top teams in MLR with their performance this weekend. They took a shot on the chin and gave it back just as hard. Joe Pietersen showed he will fight Sam Windsor for top flyhalf in the competition this year. The Legion had this game won, but a deliberate knock on by Save Totovosau resulted in a penalty try being awarded to RUNY. San Diego just needs a complete game and they can compete with anybody. This was a fairly even match, especially in the scrum where RUNY was thought to have had the advantage. Both RUNY and San Diego have put the league on notice. RUNY now have two weeks off, before heading to New Orleans. While the Legion get ready to host the defending champion Seawolves. 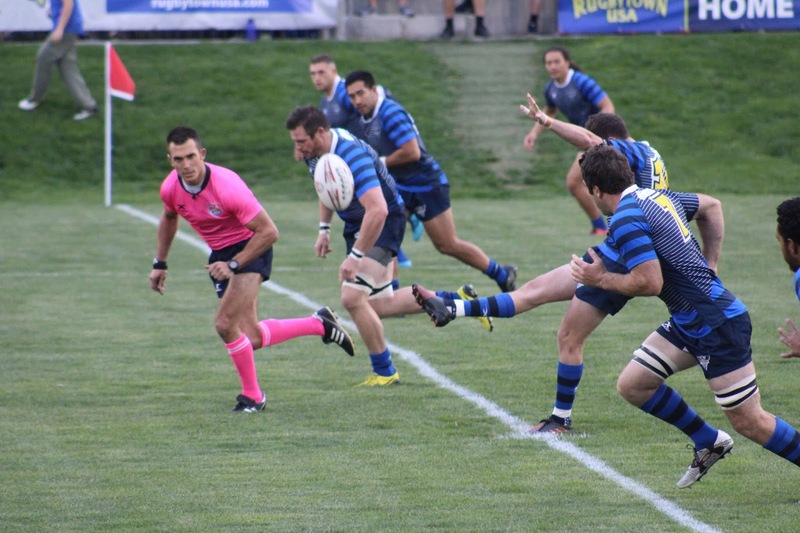 When the MLR schedule was announced, the week one championship rematch between the Glendale Raptors and Seattle Seawolves was always going to be a must watch matchup. And it didn't fail to live up to the expectations. The Glendale Raptors changed up their offense and started to play with width, instead of play crash ball. And this worked to their advantage as they controlled a good portion of the match. The Raptors were able to make numerous line breaks and had multiple chances deep in Seattle territory. Unfortunately, the butter-finger ailment showed for the Raptors in this match as they had multiple good possessions lost due to handling errors. Seattle on the other hand played their game. They let the game come to them and the SeaWall stood tall. The Seawolves made the Raptors earn every point and only gave up a few cheap plays. Ben Cima was a new addition for Seattle and he made an immediate impact. His clearing kicks helped push the Raptors back downfield. This hard fought match almost got out of hand a few times as players came together for a few "let's get to know each other" meetings. There multiple instances by both teams that could've resulted in yellow cards, but the referee decided to let it play. Both Glendale and Seattle now have the first game out of the way and know what they need to do to improve. Glendale heads to the bayou to face New Orleans on a short week. The Seawolves head down the California coast to take on the Legion. One correction here. Glendale is ahead of San Diego as they have a better try differential. H/T to u/ColonelFogsworth on Reddit for the table.